Thanks to @MichelleThomass for bringing this article to my awareness on Twitter today. Piles of plastic rubbish, ranging from thousands of drinks bottles and carrier bags to a joke severed finger and a set of vampire teeth, were collected in the latest annual survey of beach litter. Overall levels of rubbish on UK beaches last year fell by 16 per cent on 2008 figures, according to the Marine Conservation Society which organises the annual litter pick. But the conservation organisation is concerned about the continuing problem of plastic waste, which it says is overwhelming UK beaches and harming wildlife. The MCS Beachwatch Big Weekend 2009, which saw volunteers out on almost 400 beaches collecting and recording rubbish, picked up some 1,849 items of litter per kilometre – compared to 2,195 items in 2008. But litter levels are significantly higher than when the survey started in 1994, with the amount of overall rubbish picked up increasing by 77 per cent and plastic debris rising by 121 per cent, the MCS said. 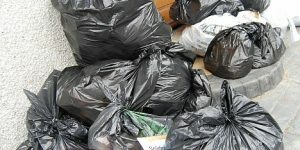 Plastic, from small shreds to carrier bags, made up almost two thirds (64 per cent) of the litter found, making up a higher percentage of the overall total than in previous years of the survey. Read the rest of “Beach litter survey reveals plastics toll” by Emily Beament at The Independent. Tetra Pak recycling is coming back to the UK! Hawaii – Message in the Waves is a BBC Natural History film and a must-see. Search for it. I’ve just watched it again. @Mrs Green: Yes, everyone should watch it. There is also an interview on Youtube with Rebecca Hosking who worked on the film and was instrumental in plastic bag free Modbury. Other towns have followed suit. It certainly made me think and change my habits. @Jane: Thanks Jane; Rebecca is an amazing woman. I saw one of her programmes about farming too, which was wonderful and very inspiring. Secretary of State Hilary Benn has been talking plastics (see http://www.letsrecycle.com) and the above website has interesting comments. Wasn’t Rebecca Hosling trying to run her family farm without oil? Plastic is a by-product of oil. We have to do more about dealing with the problem of plastics.